National Public Radio fans, hold your branded tote bags closely – you have unlimited access to over 500 NPR stations around the country and on-demand access to more than 1,000 archived programs with your iPhone.Using the Public Radio Player app means being able to listen to almost any station you want for free over the internet – you’ll never miss another episode of Car Talk or Fresh Air. Your phone is once again more than a phone – it’s a platform for the distribution of public media. The app is incredibly intuitive to use. Browse a national list of stations that make their live streams available through the app, touch the station name, and you’re instantly connected – listen to KEXP in Seattle, WA before flipping over to WFMU broadcasting out of Jersey City, NJ. Add stations to a “favourites” to make them easier to find next time. Many stations offer in-app data, such as the name of the program currently broadcasting and the station’s schedule. If that’s not enough, you can browse a catalogue of on-demand content – did you miss an episode of This American Life last week? Rest easy – it’s there for you to listen to at your convenience. If you’re still not sold, head over to their homepage to get your questions answered. But come on – it’s free. Just get it. 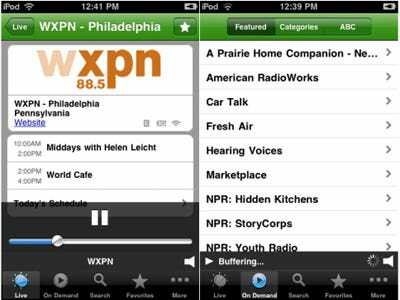 This app is a must-have for every NPR fan or newshound. Radio’s nowhere near dead, especially when you consider this versatile app.